So here is my last goofy post of the year, I will have some posts that have at least something to do with SQL and databases from tomorrow on. I just happened to hear both of these songs today and since their titles are so similar I decided to do a little poll. So the question is which of these two do you prefer? Believe it or not I will pick The Road to Hell as my favorite song. If you asked me yesterday I would have picked Highway to Hell; maybe I am not angry enough today and am in a pleasant mood, It is New Years Eve after all. SQL Server 2005 SP2 introduces the Vardecimal storage format. The Vardecimal storage format is a new storage format to store decimal/numeric data. This new storage format is not understood by SQL Server 2005 or SQL Server 2005/SP1. Just like you cannot attach a SQL Server 2005 database to SQL Server 2000, attaching/restoring a SQL Server 2005/SP2 database that has been enabled for Vardecimal storage format to earlier versions of SQL Server 2005 will fail. SQL Sever implements this by incrementing the database version number when the database is enabled for Vardecimal storage format. When you disable Vardecimal storage format on a database, its database version is decremented so that the database can now be attached to earlier versions of SQL Server 2005. Guess Who Gave This Answer In A Newsgroup? Question: I guess the key question for me is, can this be done entirely in SQL? Answer: The answer is always "Yes, we can do it in SQL!" does not mean you should!" think about factorials or worse). So who gave this answer? Sweet Child O' Mine By Guns N' Roses Or Child in Time By Deep Purple? Yesterday we talked about Whole Lotta Love and whole Lotta Rosie today we are talking about Sweet Child O' Mine and Child In Time. So which is your favorite? Child in time is a song that is over 10 minutes long; It starts slowly with only an organ then builds up to a faster pace and then stops abruptly to start over again. Guitarist Ritchie Blackmore solo is just amazing and Ian Gillan’s voice goes from quiet singing to loud screaming. If you never heard this song I urge you to check it out. He's shooting at the world. Lord I bet you have. You've not been hit by flying lead. You'd better bow your head. I have at least 3 versions of this song; the original, the live version from Made In Japan and the live version from Scandinavian Nights. So which are your favorites? Okay so today we will talk about the sys.dm_db_session_space_usage dynamic management view. IAM pages are not included in any of the allocation or deallocation counts reported by this view. Page counters are initialized to zero (0) at the start of a session. The counters track the total number of pages that have been allocated or deallocated for tasks that are already completed in the session. The counters are updated only when a task ends; they do not reflect running tasks. A session can have multiple requests active at the same time. A request can start multiple threads, tasks, if it is a parallel query. -- session_id maps to session_id in sys.dm_exec_sessions. Number of pages reserved or allocated for user objects by this session. Number of pages deallocated and no longer reserved for user objects by this session. Number of pages reserved or allocated for internal objects by this session. Number of pages deallocated and no longer reserved for internal objects by this session. What is this dmv useful for? You can use it to to help you diagnose and troubleshoot problems caused by insufficient disk space in the tempdb database. The following error messages indicate insufficient disk space in the tempdb database. These errors can be found in the SQL Server error log, and may also be returned to any running application. Whole Lotta Rosie By AC/DC or Whole Lotta Love By Led Zeppelin? So the question is which of these similar named songs do you prefer? Whole Lotta Rosie by AC/DC with Bon Scott from the album Let There Be Rock . Whole Lotta Love by Led Zeppelin from the album Led Zeppelin II . Between these two my pick is Whole Lotta Rosie by AC/DC and I think that this is still my favorite AC/DC song. You have three columns; if any of the columns is 1 you want to display 1 if they are all 0 you want to display 0. how can you do that? Now let's say we want to display 1 if all the values are 1. Now let's reverse the process and display 0 if any of the columns are 1 and 1 if all the columns are 0. "In an effort to provide customers with more secure products, Microsoft Windows Server "Longhorn" and Microsoft Windows Vista will only support SQL Server 2005 Service Pack 2 (SP2) or later when it becomes available. Earlier versions of SQL Server, including SQL Server 2000 (all editions including Desktop Engine edition, a.k.a MSDE), SQL Server 7.0, and SQL Server 6.5, will not be supported on Windows Server "Longhorn" or Windows Vista. Customers running applications with these earlier versions of SQL Server should consider evaluating and upgrading to SQL Server 2005, which was designed to take advantage of the upcoming security and performance enhancements in the operating environment." How Well Do You Interview And Do You Use Wizard Driven Programming? We were interviewing people for developer and architect positions. The developer position required about 5 years C# and SQL Server. We got a couple of good candidates but some of them were really terrible. They claim SQL server experience since 1998 but don't know what a clustered index is or they can not name even one isolation level. There were people who had 10 years experience in web development but could not explain what MVC (Model-view-controller) is or name a design pattern. People created webservices but did not know what a WSDL is????? You see this is the problem I have with WDP (Wizard Driven Programming); It's okay to use wizards but you HAVE to know what is going on behind the scenes. It's okay to use Enterprise Manager but you have to know how to do the same thing in Query Analyzer. If you never write your own scripts you will sooner or later come to a shop where they don't use these tools and changes have to be submitted via scripts. Not only do you have to script everything you also have to provide back-out scripts in case something goes wrong. respect users' security and privacy rights. 1. SMB2: Vista introduces a new variant of the SMB protocol called SMB2, which may pose problems for those connecting to non-Microsoft networks, such as Samba on Linux. 7. Five Versions: The array of Vista editions could prove to be three too many, and upgrades between versions remain an unknown. 8. Activation: The need to activate the product via the Web could prove to be a time-waster during mass deployments. Your organization can host the Key Management Service (KMS) internally to automatically activate computers running Windows Vista. To use the KMS, you must have a minimum of 25 computers running Windows Vista that are connected together. Computers that have been activated through KMS will be required to reactivate by connecting to your organization's network at least every six months. Currently the KMS software runs on a local computer running Windows Vista or the Microsoft Windows Server Code Name "Longhorn" operating system. In the future, it will run on the Microsoft Windows Server 2003 operating system. 9. Storage Space: With Vista taking as much as 10 Gbytes of hard drive space, big and fast hard drives will be a must. 10. Backup: See No. 9. Backing up desktops will take a great deal of space. --So backup only your personal data. Many options and controls are further buried, requiring a half-dozen mouse clicks or more to get to. Network settings and display settings are offenders here. --Some people said the same thing in WinXP, until they realized there is also a classic view. Vista has this classic view also. 19. Installation Can take hours on some systems. Upgrades are even slower. 20. HHD Hybrid Hard Drives. These are potentially a huge performance booster, but there's little information and support is available (even though should be available). --Since when is having an emerging technology that will boost performance a shortcoming? WordPadAbility to open .doc files has been removed. This question came up on tek-tips. Service Pack 1 addresses issues that were found through a combination of customers and partner feedback, as well as internal testing. The issues addressed range in severity from places where the syntax coloring was incorrect to customer reported crashes in various scenarios. In some areas, more than 50% of the bugs addressed were reported by customers through the MSDN Product Feedback Center and Microsoft Connect. Overall, Service Pack 1 offers customers improvements in responsiveness, stability and performance for Visual Studio 2005. What you have to do is use Common Table Expressions or use a subquery. Below are both methods. 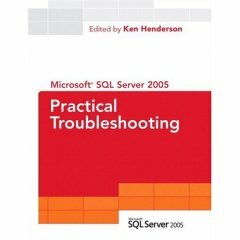 SQL Server 2005 Practical Troubleshooting: The Database Engine Is Shipping! So here we are 9 years later. We are still married have 3 kids and bought our second home this year. So let me give you a little background of how I met my wife etc etc. I met my wife in a bar on the upper eastside in New York City. I don’t remember the name of the bar but I do remember that we went to Elaine’s for a drink and also to a place named the Cowboy Bar. Fast forward to the wedding date; we got married twice first at City Hall on December 11th and then we did a church wedding on August 15th (the pictures are from that day) We did the December wedding separately so that we could start my Green Card process; my wife is a third generation Italian-American but I had Dutch and Croatian citizenships. 5% of the wedding guests did jail time. The reception was held at the Kitano Hotel which is located at 38th and Park Avenue. 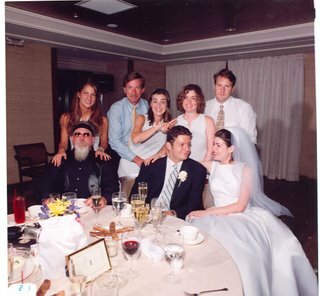 I did not have a huge wedding only 65 or so family members and some of our closest friends were invited. Out of those people there were 3 who did some jail time. 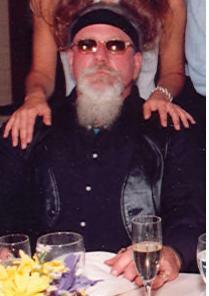 One of them is Brendan who was the head of the NYC Hells Angels chapter at that time. Another was brought by a friend and the last one was a friend of mine who did jail time because he beat up a cop. The Hells Angel did not dress up of course, if you look at the picture you can see me next to my wife. 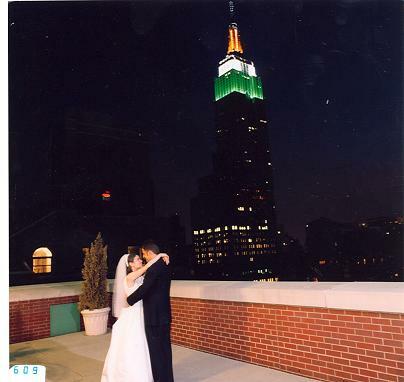 The other picture is me and my wife on the roof. The reception had 2 huge balconies; one was facing the Empire State Building and the other one was facing the Chrysler Building. The good thing when having your wedding at a hotel is that you can just walk to your room. Once you are married don’t have kids right away; your live will change and you won’t be able to do anything for a while. So that is what we did; we waited 4 years to have kids. We visited Paris and Amsterdam and bought a house near Princeton before having our first son Christian. Then my wife became pregnant with twins and we had to sell our house and buy a bigger house. If owing you house is the American Dream then selling and buying your next house has to be the American Nightmare; what a stressful situation. After that ordeal I said that the next time I move will be in one of those 55+ community houses (I still have about 20 years to go). So today we live in Princeton and we have Catherine and Nicholas to keep us awake at night. My wife and I usually buy our Christmas tree on our anniversary. In the city we would pick up a Charlie Brown on 2nd avenue and 79th street; out here we go to the farm and chop down our own. Somehow my wife thinks it is also a tradition to watch Serendipity; if I have to watch a movie with Kate Beckingsale I prefer Underworld but hey you have to be nice on your anniversary…. Forget about the haircuts (I rescheduled for tomorrow); where do I leave our 3 kids? How do you get the domain name that your SQL Server machine belongs to with T-SQL code? You can use the undocumented procedure xp_regread; I have tested this on SQL Server 2005 and on SQL Server 2000. Be advised that since this is an undocumented procedure that it might not be available in the future or it might be changed either because of a service pack or a hot fix. Don't use it as production code! On Friday 1st December 2006 the development team officially announced that Data Dude was done and was being released to manufacturing. It should be available for download to MSDN subscribers on December 7th 2006 and generally available for purchase on January 1st 2007. This release marks the end of the first leg in a very exciting journey to revolutionize the ALM space and finally bring the database into the application lifecycle.